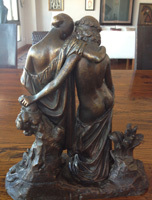 I bought this Pradier sculpture in Italy (see attached photos sent from my iPhone) and would like to obtain information regarding authenticity and possible price of the piece. The size is 25,5 cm and on one side it has the letters « D A » and the number 52. It is signed twice, once in cursive. Also it is on top of a clock. Thank you very much. 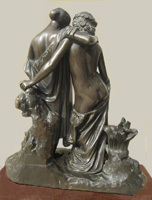 In his recent catalogue raisonné of Pradier's works, Claude Lapaire surmises that this group, known as L'oiseau tombé du nid (Bird fallen from its Nest), was modelled by Pradier the same year as his Flore et Zéphyr, which also consists of two standing figures and which he conceived in November 1841 at the beginning of his last stay in Rome. Only three examples are listed in the catalog (notice n° 169, pp. 308-309). 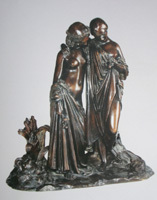 The first  and probably earliest  is an edition in plaster, 28 cm tall, on a flat, rectangular base with brass plaques inscribed « J. PRADIER » and « SOCIETE D'ENCOURAGEMENT DES ARTS UNIS ». The other two are later bronze editions. One of them, measuring 28 cm, was sold at a Sotheby's auction in London on 22 May 1996. The other, measuring 25,5 cm like yours, was sold in 2006 by the Galerie Jacques Fischer in Paris. Both of these, like yours, have an oval terrace. 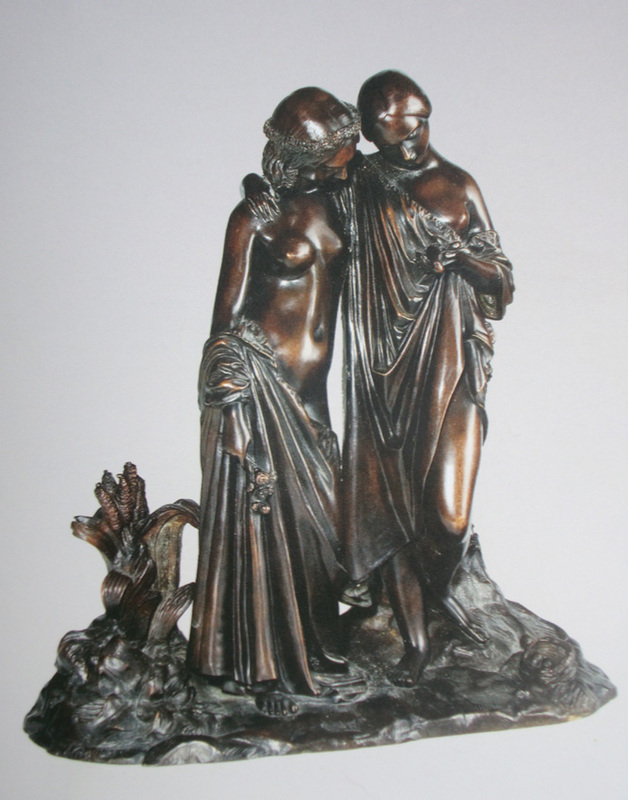 We don't have a photo of the bronze sold by Sotheby's but the Fischer bronze, which is reproduced in Fischer's 2005 catalog and also in Claude Lapaire's catalog, is very similar, if not identical, to yours. It has the same cluster of reeds next to the figure on the left and the same tree trunk with a lizard behind the figure on the right. On this color photo reproduced in the Fischer catalog, I can also see a signature « J. Pradier » in cursive exactly the same as on your piece, as shown in your sixth photo above, and in exactly the same position towards the left end of the terrace. 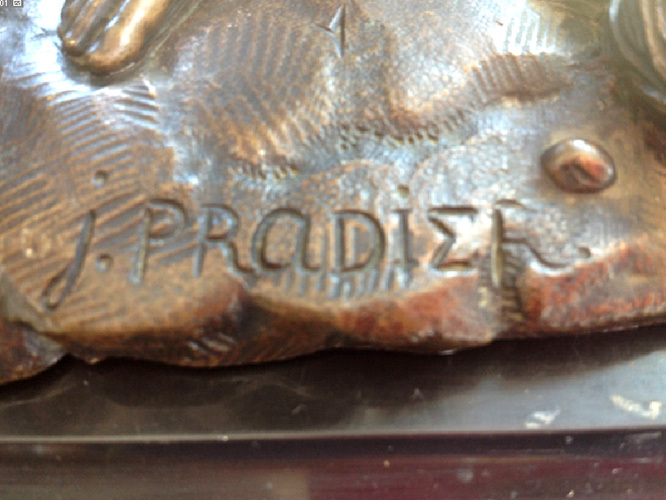 This is a clear indication that your bronze and the Fischer bronze were probably cast from the same model. 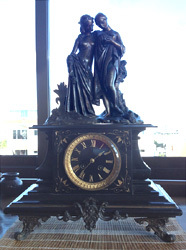 In fact, the only difference between the two pieces seems to be that yours has a second signature at the feet of the figure on the right, higher up on the terrace, as shown in your seventh photo above. But while the signature in cursive is « standard » on many of Pradier's works (see the examples in Claude Lapaire's catalog, pp. 457-458), this second signature has an unusual mixture of cursive and block letters which I don't recall having seen elsewhere. My guess is that the original signature being so close to the edge of the terrace and not easy to see, the second one was etched on in this more visible position after your bronze was cast. You mentioned that your piece has the letters « D A » inscribed on one side. I can't see them on your photos but I am wondering if you read them in the wrong order. In that case they could be the initials « A. D. » for the founder Auguste-Maximilien Delafontaine, who succeeded his father Pierre-Maximilien in 1840 and who is known to have cast several other small bronze works by Pradier. 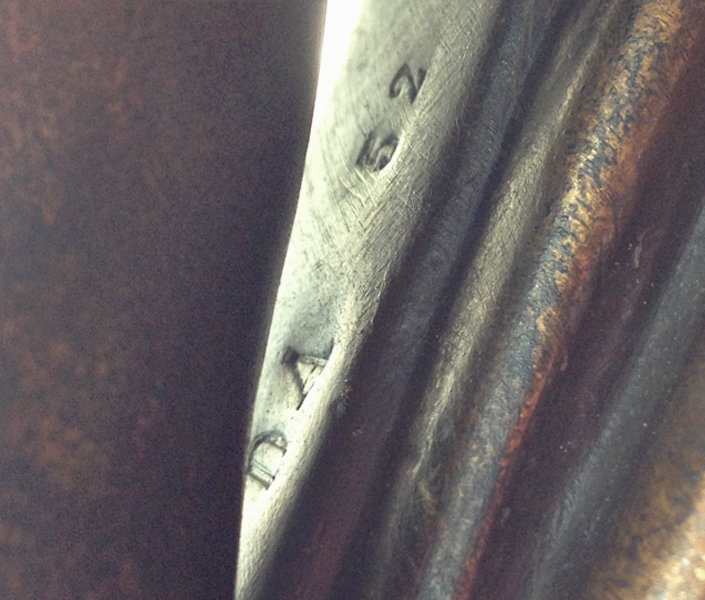 As for the number 52, I don't think it means that this was the foundry's 52th casting of the work. It would more likely be a catalog number or some other number used by the foundry for identification purposes. With regard to the market value of your bronze, many different factors are involved. You can browse through the announcements in the « Ventes » (« Sales ») section of this website to get an idea of the prices which similar works by Pradier have obtained in recent years (look for the « résultat »  « result »  in the last column of each announcement). As you will see, they range from a few hundred to several thousand dollars. I don't know how much the Fischer bronze was sold for. Maybe $6,000 or $7,000. But although it is identical to yours, it has a very fine patina (perhaps restored) whereas yours shows a lot of wear and tear. Even so, seeing that it's a very rare piece, you should be able to obtain a decent price. You may want to get an estimate from Sotheby's, Christie's or some other auction house. Only a few days ago Freeman's in Philadephia sold a Sapho assise for $6,500. Thank you very much for your very detailed information I enjoyed it SO MUCH, as I am a lover of all arts and their history. Here is a pic of the torso letters. As far as the inquiry about market value [is concerned], do you suggest I send only pictures and the info I sent to you or is it a good idea to include part of the info you sent to me? Too bad the letters inscribed on your piece are « D A » and not « A D » which would mean it was cast by the well-known founder Auguste Delafontaine. I have no idea what they stand for. If you submit it for an estimate it would certainly help if you included some of the information I’ve provided. 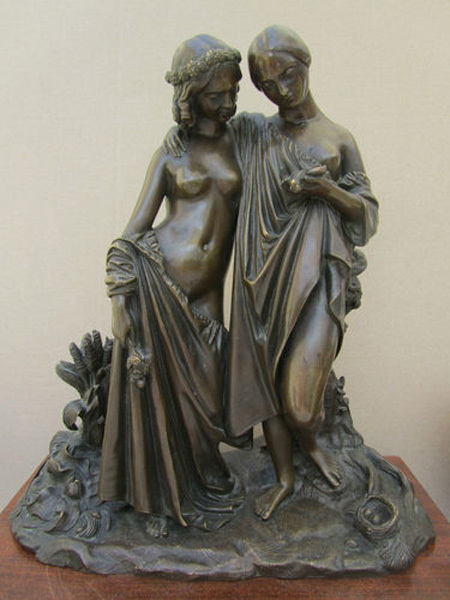 You should especially quote Claude Lapaire’s catalogue raisonné, which is the most complete and up-to-date study of Pradier’s life and works and which documents only two other bronze examples, one of which was apparently cast from the same mold as yours. But its market value would probably double if you could have it restored. I don’t know where in the States but in Europe the best place to go to would probably be the Susse foundry in Arcueil, near Paris, which was one of the original editors of Pradier’s statuettes (see the page about their restoration activities on their website at www.susse.fr/en/page_restauration.php). In my initial reply above, I forgot to mention that the plaster example of L'oiseau tombé du nid was shown at the Pradier exhibition Statues de chair in Geneva and in Paris in 1985-1986. At that time the two bronze examples listed by Claude Lapaire had not yet come to light. 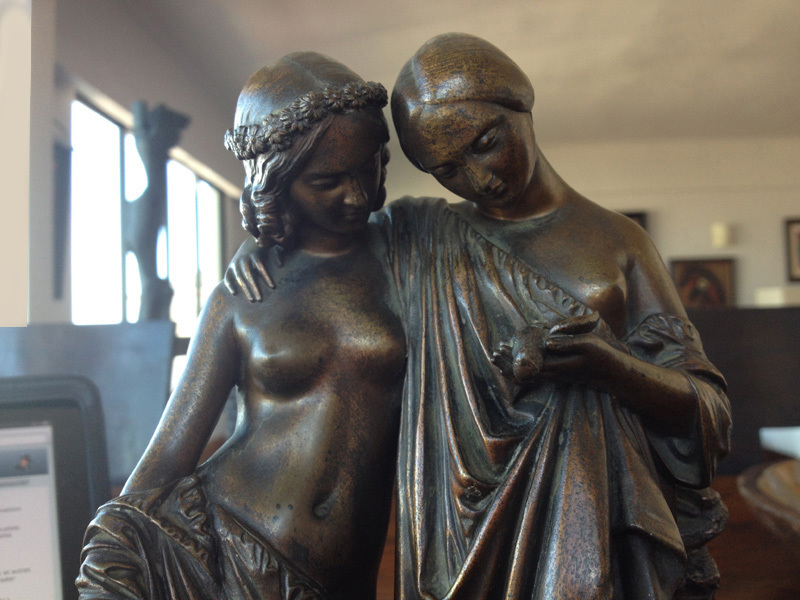 In the Statues de chair catalog, Jacques de Caso points out that the dead bird found by the two young maidens can be interpreted as a veiled allusion to the loss of virginal innocence, a popular theme in art and literature, especially in the 18th century (cf. the painter Jean-Baptiste Greuze). 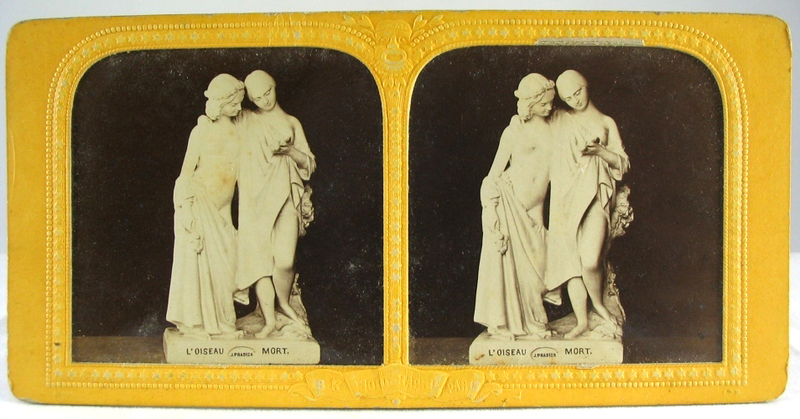 In the stereo view on the left the signature « J. PRADIER » is inscribed in an oval space centered on the base of the work between the words of the title L'OISEAU MORT. The model in the view on the right also has an oval space for the signature which, however, is not visible on the photo. No title is visible either but the English equivalent The Dead Bird has been pencilled in on the cardboard frame, just below the right-hand image. These views attest to the fact that other examples of the plaster model were in circulation in the 19th century. I am very confused regarding Christie's or Sotheby's estimate or the possibility for them to sell my Pradier sculpture. Their answers seem strange to me since they said something like they don't sell this kind of piece, although I have seen on the internet that they have sold not only similar ones but much more simple pieces not with the special features and beauty of mine. Since you are a connoisseur I would like to ask you about this. Has it something to do with the market? I ask this not necessarily in reference to prices but just to know how these things work. Without knowing exactly what you wrote to Christie’s and Sotheby’s and what they replied, I can only guess that one of their concerns is your sculpture’s patina, which in your pictures does not appear to be in good condition. Whether it was like that from the beginning or whether it has deteriorated over time, I’m not able to say. In any case, as I mentioned before, it might be possible to have it restored. I have been in contact with a specialist of 19th-century foundries, Elisabeth Lebon, who just published a new book on the subjet. I’ll ask her what she thinks. 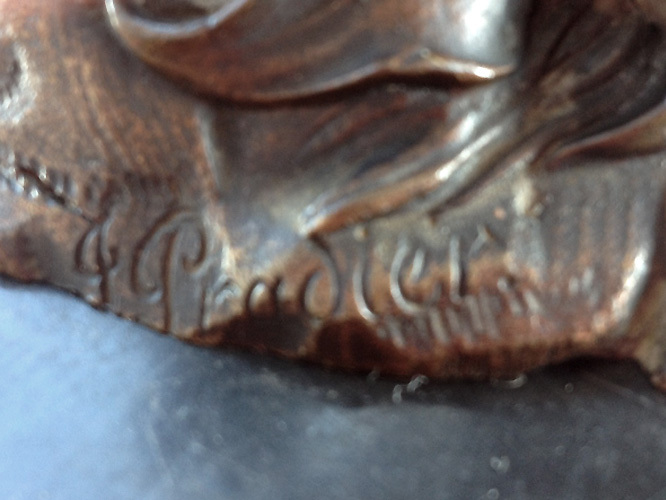 In the meantime you might want to contact other auction houses which have sold Pradier works in the past. You’ll find many links to them in the “Ventes” (“Sales”) section of my website. En ce qui concerne la marque « D A », je ne l'ai notée qu'une fois, dans la description d'une paire d'Atalantes d'après Puget qui était proposée à la vente chez Sotheby's Paris le 29 avril 2004 (« Le goût de l'antique », n° 184). Il s'agit de statuettes de 25 cm portant une marque estampillée « D A » sur la terrasse, et une autre « D AAA » à l'intérieur, sans autre marque de fonderie. Cela est signalé dans la notice mais il n'y a pas de photo de ces marques. Je suis d'accord avec vous que cela ne ressemble pas à une marque de fondeur, mais plutôt à une marque ouvrière. Soit les initiales d'un ouvrier, soit effectivement un repère par rapport au catalogue (le chiffre 52 renforce cette hypothèse). Il peut aussi servir de repère au rassemblement correct des parties. Ce type de marque est généralement invisible, à l'intérieur des bronzes, mais pas toujours. Quant à l'origine de cette épreuve, je n'ai pas les capacités pour apporter un éclairage particulier à votre question, mais à priori, je souscris cependant à votre interprétation qui me semble très logique. Deux épreuves identiques de dimensions similaires viennent très probablement du même modèle (pas du même moule s'il s'agit d'une fonte au sable, le moule est détruit à chaque épreuve), voire chef-modèle  si l'éditeur a pensé qu'il en vendrait en nombre suffisant pour rentabiliser les frais d'établissement d'un chef-modèle, et une signature peut être ajoutée en la ciselant sur l'épreuve. A Laura Castillo: Any news about your bronze? I happened today on the website of an antique dealer in Beverley Hills, CA, at www.beverlyhillsantiques.com who has a large number of bronzes for sale. I have no idea if he would be interested in your piece but it might be worthwhile to contact him. I just read Elisabeth Lebon's addition to our discussion which is very interesting information. I will contact the antique dealer in Beverly Hills and let you know what he replies. 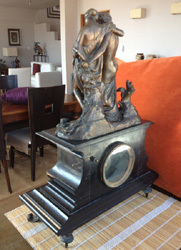 I am thinking of having the piece restored at the Susse foundry. If there is anything new in addition to what we have so far, please keep me informed. 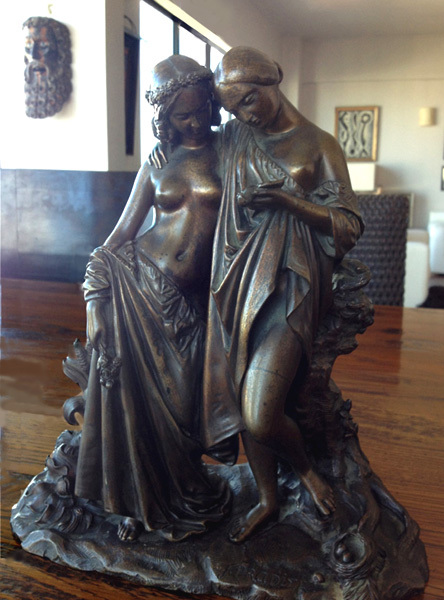 Possédant un bronze de Pradier, L'oiseau tombé du nid, je m'apprêtais à le passer en vente sur ebay. Cherchant quelques informations, j'ai découvert et consulté votre forum avec beaucoup d'intérêt, et particulièrement ces pages sur « Une rare épreuve... ». Avant de valider l'annonce, je voulais vous informer de cette vente prochaine, et vous faire parvenir des photographies de ce bronze identique à celui présenté (hauteur 25,5 cm). La différence est la présence de la petite plaque mentionnant « O. Trubert. / Rue de Choiseul N° 17 ». J'ai trouvé peu d'éléments sur cet éditeur de bronze. Je suis très content de savoir qu’il existe encore une autre épreuve de cette œuvre. Et très curieusement  le saviez-vous?  sa petite plaque la rattache d’une manière inattendue à la biographie rocambolesque de… Balzac. Mais je dois remettre à plus tard de vous raconter cela en détail car c’est assez compliqué. Avant de rechercher quelques renseignements sur Trubert, le lien avec Balzac m'était inconnu. J'ai donc récemment découvert les péripéties « Mme Louise de Brugnol, Balzac, Mme Hanska »; comme vous le mentionnez, l'histoire parait compliquée. Concernant l'annonce, elle est rédigée et sera bientôt sur ebay, en mode enchères. Ayant consulté et apprécié votre Forum Pradier, j'ai préféré, par correction, prendre contact avec vous avant de la publier. Merci pour ces infos. 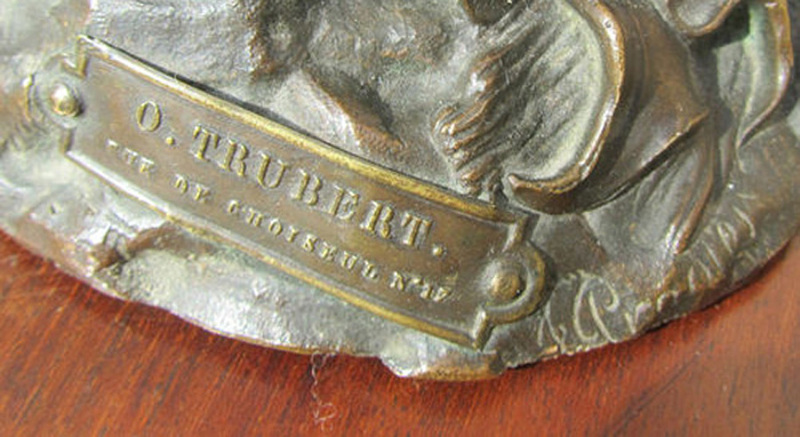 Entre-temps j’ai découvert qu’une épreuve identique à la vôtre, également avec une inscription « O. Trubert », a été vendue le 28 mars dernier à l’Hôtel des Ventes Michel Colombe à Tours. J’ignore à quel prix mais elle était estimée 150/200 euros. Cliquez ici pour ouvrir le catalogue. Il s’agit du lot n° 230, « les dénicheuses d’oiseau ». Je vous envoie la photo qui figurait dans l’annonce originale et qui n’est plus en ligne. En l’agrandissant on aperçoit une partie de la plaque sur le côté gauche de la base. Il ne s'agit pas d'une épreuve identique, mais de la même que celle de l'Hôtel des Ventes de Tours. L'estimation était en effet celle que vous mentionnez, car la signature Pradier n'avait pas été découverte et annoncée.